A stuffed young male mammoth found in August 2012 in the estuary of the Yenisei river in Taymyr Peninsula is presented in the Whale Room of the Zoological Museum in St. Petersburg. A mammoth studies center is being built in Yakutia. An international center for mammoth studies will be opened at the Northeastern Federal University (NEFU) in Yakutsk. One of the goals of center, which is being built in partnership with the Korean Fund for Biotechnology Research, is to clone a mammoth. Scientists are in the early stages of research and are closely examining obtained data. 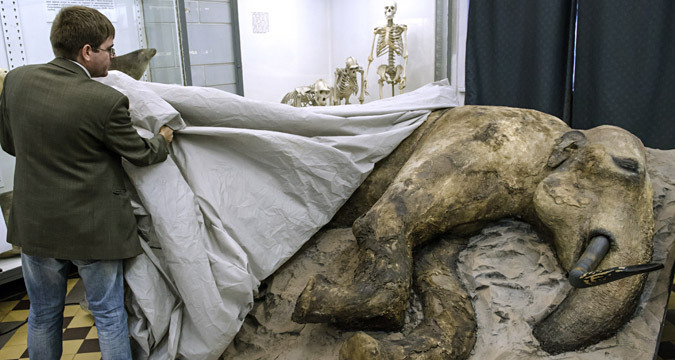 “When the world mammoth center is opened at NEFU, we will see progress in paleontological research, and will get closer to the ultimate goal,” Professor Woo-Seok Hwang said. The center will help improve the competitiveness of Russian science in the field of paleontology, as well as the development of tourism, Egor Borisov, head of the Russian internal republic of Yakutia, said. The international mammoth center is also expected to become a tourist attraction. Along with a museum, the center will house underground scientific laboratories and conference facilities. NEFU began collaborating with the Korean Fund for Biotechnology Research in 2012.